Will Hamas drag us into another round of launches, rockets and red alerts less than two weeks before Israeli elections? Approaching a lull? Not according to newspaper headlines Friday morning which announced tensions, high alert, army deployment and the transfer of IDF forces to the south of Israel. The Egyptian delegation is negotiating with Hamas to try to restore calm, but it's not at all certain that the terrorist organization will accept the offer. Instead, we may be dragged into another round of launches, rockets and red alerts less than two weeks before Israeli elections. "I see the logic of Hamas which says it's time to set the facts," Arab affairs commentator Zvi Yehezkeli said on Channel 13 News on Friday. "Imagine yourself facing an enemy that has more military capabilities than you and you only have the patience, the stubbornness and the ability to harass the enemy." 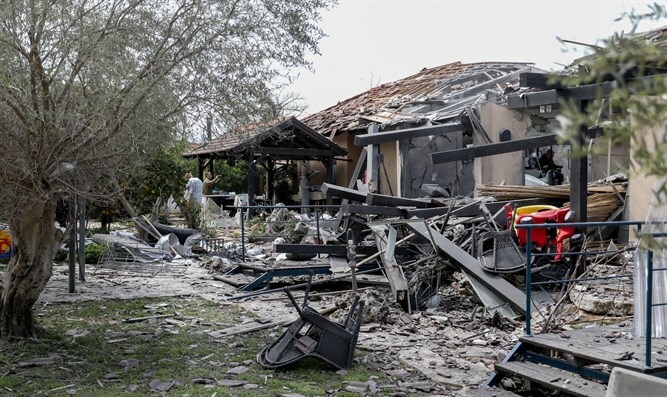 For those who may have already managed to forget, a summary of recent episodes: Hamas fired a rocket which hit Israel and destroyed a house in the Sharon area and Israel attacked Gaza in return. As far as Israel is concerned, the story is closed. As far as Hamas is concerned - it's not. "The profit of Hamas at the moment is related to the improvement of conditions on the day after," Yehezkeli explained. "They want an agreement and this is what the Egyptian mediator discussed with them Thursday night." "The mediator proffered a very generous offer, which includes increasing their fishing area, opening the crossings and bringing in goods that have been banned since Operation Protective Edge - cement, iron and other building materials. However, Hamas is currently refusing the offer." "A year after they initiated these protests, Hamas is reaping the benefits. They found something that bothers us and we don't know what the future holds," Yehezkeli said. An agreement or an escalation is currently on the agenda. According to Yehezkeli, if an agreement is reached and the state of Israel pays a little more money to silence Gaza, Hamas will hold quiet demonstrations devoid of violence, and if the negotiations fail, the violent demonstrations on the fence will continue as usual. "Yahya Sinwar will tell the Gazans to break through the fence and harass the IDF soldiers. Israeli snipers will shoot them, Israel will be humiliated again and on Tuesday we'll see them reach an agreement until the next missile," Yehezkeli said. And the next missile will come - that's definite - the question is only when. "There will be a missile," Yehezkeli said. "I don't know whether it will before the elections but there will definitely be another missile because they broke the psychological barrier of firing at the center of Israel. But as I said, everything very much depends on an agreement. If there's no agreement and we continue these tensions, we'll see a missile heading towards the center of the country." And what about the IDF forces deployed in the south of Israel? According to Yehezkeli, they're there only for the sake of "being seen and feared." "I don't know how quickly the armored forces and the tanks will enter Gaza. I think that they're currently only there as a threat to Hamas to accept our proposal. It's a bit embarrassing, but ultimately it can be solved with money. Hamas wanted money and its goal was achieved - it fired at the center, it received money, quiet for quiet. We'll go to elections and the day after we'll wake up to the Gaza problem." "Of course," Yehezkeli quickly retorted. "There were no demonstrations on the fence a year ago. Since the demonstrations began, you know how much money and how much attention Hamas has received? How many donations from the world? How much attention from Qatar, the Arab countries and Egypt? Extortion definitely pays off." "[Former Hamas leader Sheikh] Ahmed Yassin wrote in the 1980s that in actuality, there are no forces here. Israel is a strong country with nuclear power and planes and Hamas lacks these abilities. How do they have the courage to start up with Israel? Precisely because Israel won't use its weapons against them." "It's not that they have the courage," Yehezkeli asserted. "They simply don't see Israel as strong and this is our weak point. They know that we really won't shoot at Gaza because we'll use the 'tap on the roof' procedure and we'll make a thousand calculations before we act. They kill their people which we would never dare to do. They trust that Israel will be responsible and that's where they get their courage to act." "Hamas sees this as a battle of minds between two societies - a Western society that sanctifies time, routine and the value of life with a Middle Eastern society that has all the time in the world, has no weapons and will always harass us until we say 'enough.' It's not a matter of courage, but it's a matter of two conflicting approaches." An agreement or not - one way or another - the next time missiles are fired at the center and Hamas will quickly declare that the missile was launched unintentionally, don't be so quick to believe it. "Yesterday they admitted that the missile was not a mistake after all," Yehezkeli concluded.